This Demonstration estimates the probability that a dissatisfied consumer files a complaint about a faulty manufactured product. It uses the expanded Fermi solution as the method of calculation. It is based on dividing the number of complaints by the assumed number, , of units produced or still unconsumed and by a set of successive probabilities, to . These are, for example, the probability that spoilage or failure has occurred, that it has been discovered by the consumer, etc. All these factors are specified by their estimated upper and lower limits and are used to calculate the best estimate of the complaint probability analytically and by Monte Carlo simulation. In the "standard Fermi solution", one multiplies guesses of several factors to reach an estimate. In the expanded version, ranges of the factors are entered instead of their values. 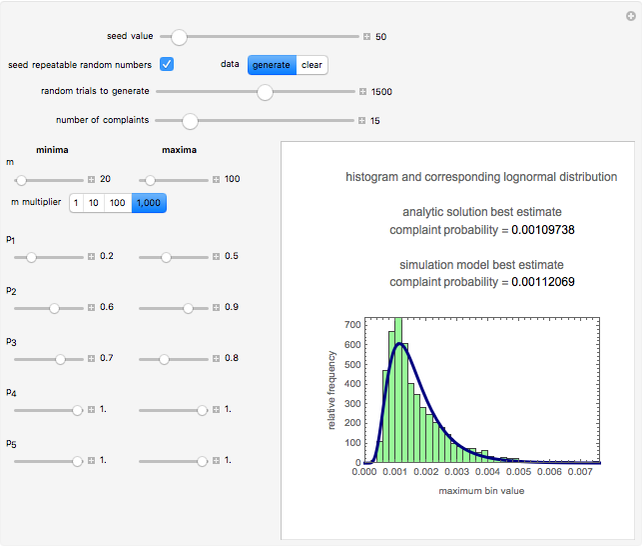 The factors are: the number, , of received complaints, entered by a slider; the lower and upper bounds of the number of units produced or still in existence, to , set with sliders and a dropdown menu; and the lower and upper bounds of five probabilities ( from 1 to 5) specified by and also set with sliders. 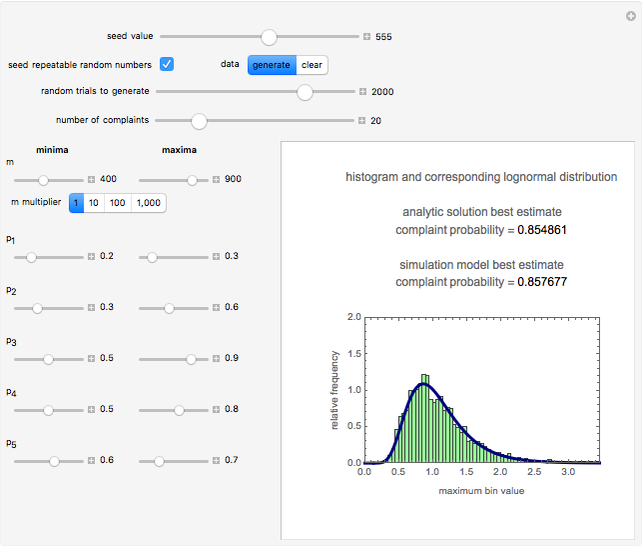 Monte Carlo simulations are done to determine the complaint probability for a random combination of the factors within their respective ranges as explained in . This can be done with or without a seed. Check the "seed repeatable random numbers" box to generate a repeatable random sequence from the seed selected using the "seed value" slider. 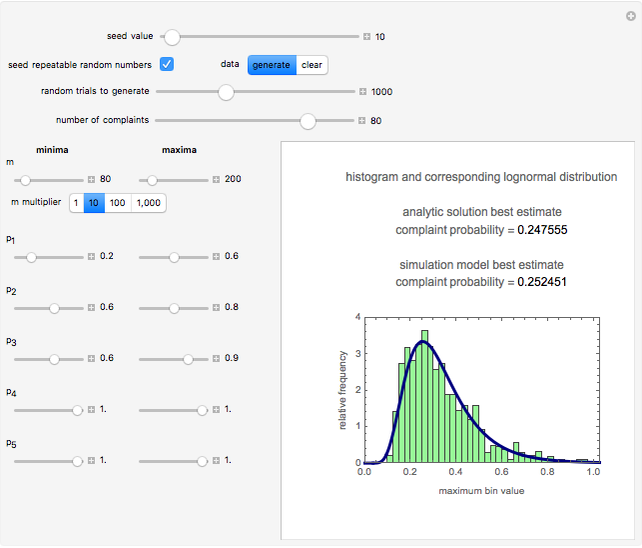 The number of repeated trials is entered using the "random trials to generate" slider. The program generates a new dataset whenever the value of any control other than the clear button is altered. For a new random dataset at the current control settings, click "clear" followed by "generate". In case the number of units produced or still in existence is known exactly, set equal to . For scenarios involving fewer than five probabilities, set the unused probabilities' minimum and maximum values to 1. This will eliminate their contribution to the calculated probabilities' estimates. 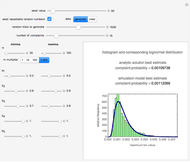 The panel shows the program controls at their current settings, a histogram of the complaint probability estimates computed in the repeated trials, and the lognormal distribution having the same logarithmic mean and standard deviation as the generated estimates depicted as a solid blue curve. 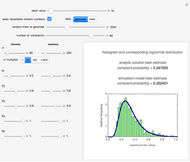 Explanation of the lognormal distribution emergence can be found in . 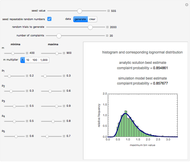 The plot title's text includes the analytic solution "best estimate" and the one derived from the lognormal distribution's mode. Estimates for and outside their sliders' allowed range of 1 to 1000 can be obtained by setting the " multiplier" setter bar to the appropriate factor. Notice that if all six factors' (i.e., and the five 's) minimum and maximum values are the same, the program will render the conventional Fermi solution plotted as a spike. Also, if all but one of the six factors' minimum and maximum values are the same, then the program will generate random estimates with a uniform distribution. In that case, although the program will still generate a corresponding lognormal distribution curve, it may no longer be representative. If the entered number of complaints, , exceeds the maximum allowed by the current settings of the factors, the corresponding calculated best estimated complaint probability ) will appear in red. At that point will be automatically reduced until . If the automatically adjusted still results in , will remain red. Since a best estimate indicates more than one complaint per unit, its value should be ignored. This Demonstration may also be used to estimate any of the other five probability values if the complaint's probability is known or if its upper and lower limits can be estimated. Mark D. Normand, Micha Peleg, and Joseph Horowitz "Expanded Fermi Solution for Estimating a Complaint's Probability"